Find out how to best reach your students! Knowing this information can allow you to get them more engaged in learning and get them motivated! Multiple Intelligence Theory suggests there are different ways we learn and process information. Each person possess all the intelligences. These intelligences usually work together in complex ways. 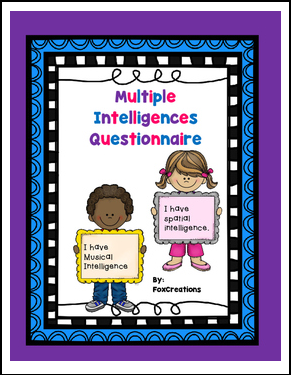 The intelligences interact with each other and don’t exist by themselves. The Multiple Intelligence Theory can help students become empowered learners. With this checklist students can determine their strongest areas and help them tap into deeper levels of motivation and learning. This checklist can help teachers see what their students are strongest in and the ways their students process the information best. This will allow them to provide opportunities and lessons that work naturally with these intelligences. This product is copyrighted and intended for you to use in your classroom only. Sharing with other teachers or entire school district is prohibited. 3. Give a rating and a comment—even a short one. Each time you leave feedback, TpT gives you Feedback Credits that you can apply toward future purchases. It takes just a few seconds!